In the July/August issue of MetroDoctors, Dr. Peter J. Daly addresses the challenge of providing patients with better patient attention, quality of care, and more successful outcomes while controlling costs in today’s healthcare landscape. Summit Orthopedics is committed to bringing comprehensive orthopedic care to our community. As part of that commitment, we are honored to share our experience as an orthopedic practice with our healthcare colleagues as well as with the patients we serve. The July/August issue of MetroDoctors features a byline by Summit’s Dr. Peter J. Daly. His article addresses the steps we took to successfully expand an independent medical group. He explains how Summit’s expansion of services reflects our commitment to patient care—and the national Triple Aim healthcare objectives of higher quality, better patient service, and reduced costs. These healthcare values were actively considered in the development of the new Vadnais Heights Surgery Center, a project in which Dr. Daly was instrumental. Dr. Daly is Summit’s medical director of surgical services, and an orthopedic surgeon with a practice in sports medicine and joint preservation and restoration. 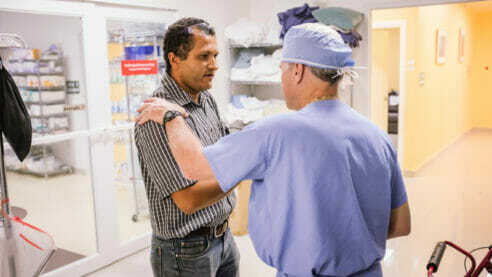 In addition to his contributions to elevating the quality of healthcare in the Twin Cities, Dr. Daly is the co-founder of the Holy Family Surgery Center in Honduras, where Summit’s medical providers regularly volunteer their services. MetroDoctors is the membership journal of the Twin Cities Medical Society. It features articles of interest to physicians and healthcare administrators in the Twin Cities. Topics range from the economics of medicine and advancements in technology and healthcare legislation to unique mission trips of member physicians. At Summit, we are committed to educational contributions that support our medical community and enhance the healthcare experience of our patients. You can read Dr. Daly’s article in its entirety here.